A Large-Format Printer is used for printing large-scale items on various types of media. 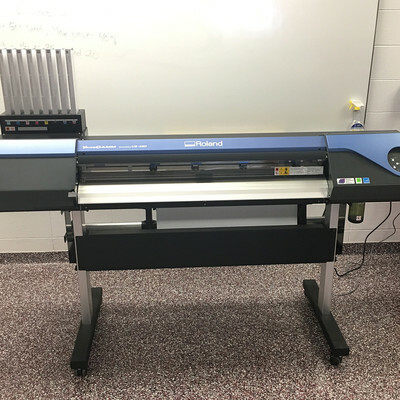 The AHS Fab Lab has a 42" large-format printer that can be used to print posters, signage, stickers, banners, and canvas. Have a picture that you want blow up? Drag and drop your photo into Roland VersaWorks and load your type of paper in the machine and the printer will do the rest. Vinyl Cutters can be used to make stickers and signage for windows, signs, and apparel. 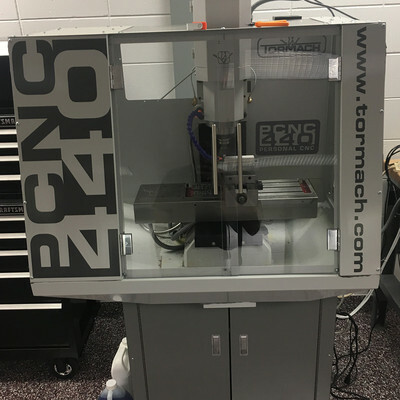 The AHS Fab Lab has two 24" Roland cutters that can be used in a wide variety of ways. Simply import a jpeg or copy and paste a design from Illustrator into Cut Studios and you are ready to cut. 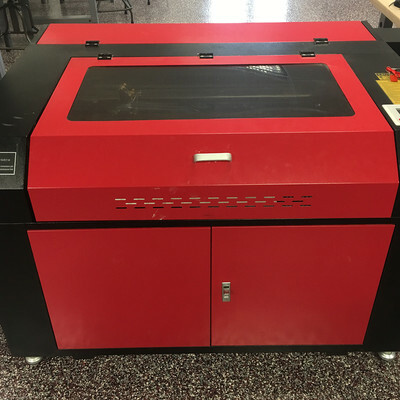 The AHS Fab Lab has two 100 watt laser engravers. These lasers take basic to advanced black and white designs and engrave them onto substrates such as wood, glass, or plastic. Lasers also have the ability to cut through thin pieces of wood, giving designers the option to do 3-d and 2-d modeling. 3-D Printers can be used to prototype or create functional models by laying down thin layers of plastic until a 3-D shape is created. The AHS Fab Lab has four of these printers. Browse through thousands of ideas on Thingiverse.com or design yourself on Tinkercad and then print off on one of the machines. 3-D Scanners can be used to replicate a product or item that already exists by using high-powered cameras to scan your image into a software program. From the program, you can import your object to one of the 3-D Printers or CNC Mill to recreate, or you can edit your object in one of the design software programs. 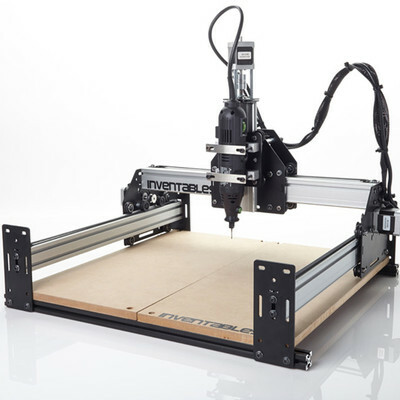 CNC Routers can be used to put a design into a substrate such as wood, tile, or plastic. The AHS Fab Lab has two X-carve routers that can be used to make signs, wall decor, guitars, and furniture among other things. Design in the free web-based program, Easel, or take your designs to the next level by using MasterCam. 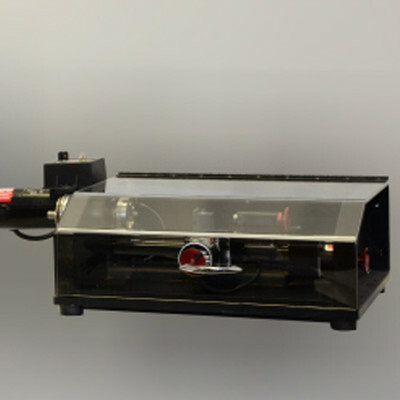 A CNC Mill can be used to automatically drill, cut or turn a substrate, most commonly metal. The AHS Fab Lab has one CNC Mill that can be used to engrave metal signs, or make common metal products. This program uses a design software called MasterCam. CNC Lathes can be used to create cylindrical products out of wood and metal. 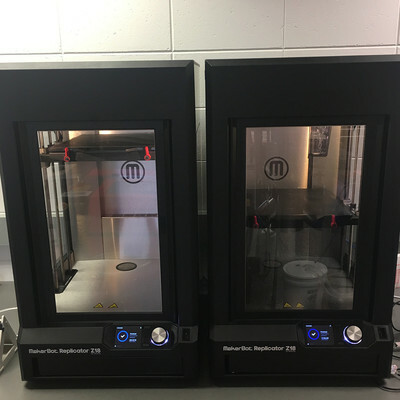 New to the AHS Fab Lab in the Fall of 2017, the CNC Mill can be used to create rolling pins, keychains, furniture accessories, and fishing lures. Import your design from one of our software programs into Turnmaster pro and watch your stock piece of wood or metal transform into your creation. The AHS Fab Lab has an area dedicated to hand tools that will help put the finishing touches on a project. 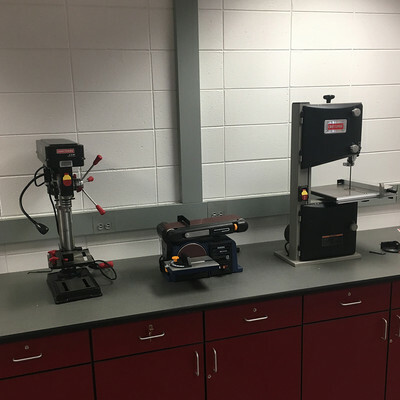 Whether you need to clean up some metal edges on the grinder or fine-tune an edge on the bench sander, the AHS Fab Lab has the tools to complete the task at hand. 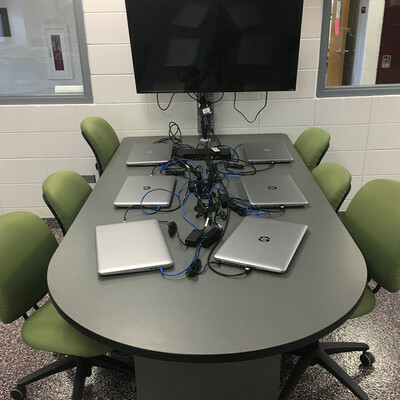 The AHS Fab Lab Collaboration/ Design area features 18 laptops all equipped with the latest software to run all of the machines in the lab. It features three 42" flat screen TV's that mainstream communication between groups. Each computer is hooked up to the TV using high-speed HDMI chords. If you want to share your idea with your group, simply press your computer number on a remote and your design will appear on the TV. Want to teach or engage a larger group? 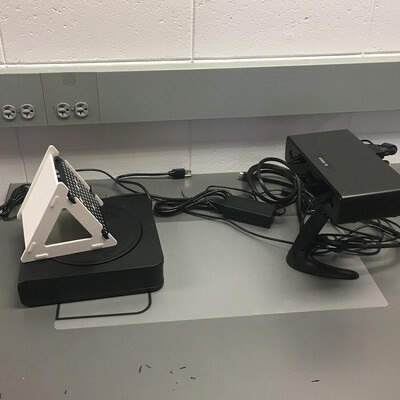 The head computer on the instructor desk hooks up to the smart board along with the other 3 TV's.